My friends at Char-Broil sent me one of their new Infrared cookers to test drive. 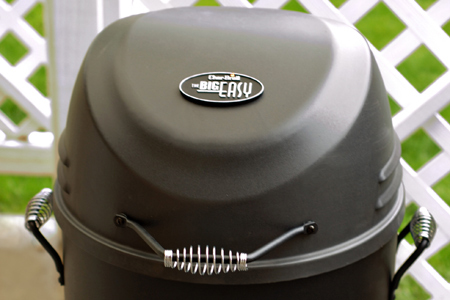 This unit is a propane-fired smoker, roaster and grill that obviously builds on the consumer success of their Big Easy® Oil-less Turkey Fryer. The concept looks sound to me. Between the outer wall and inner wall of this versatile cooker is a fully enclosed, specially designed propane burner. The heated inner wall radiates natural infrared heat that penetrates food evenly and seals the juices inside. 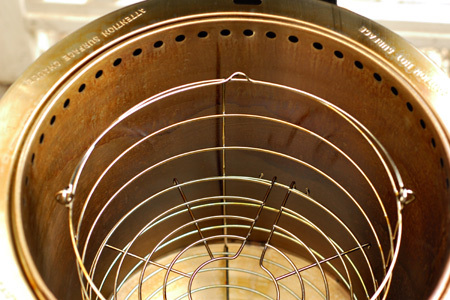 The hot air that is generated escapes out of the top of the cooking chamber before it has a chance to dry out the food. The result is meat that stays moist and tender. 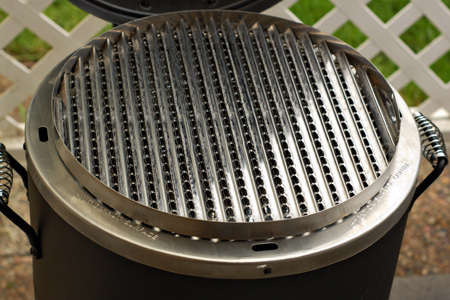 The Smoker, Roaster & Grill can easily serve as the only cooker in the backyard. Right out of the gate, I have to say that I was intrigued by what this unit boasts. The idea of a single unit that does all they advertise was, and still is, very interesting. Although it appeared to have adequate packaging, the unit sustained a little bit of damage in transit. The bottom of the main cylinder was slightly out-of-round and dented in some places. This was easily remedied by bending things back into place. There were also a few other parts that were slightly bent and/or misshapen. This required about 30 minutes and it went very smoothly using the clear instructions that were included. I was especially impressed with how the fasteners were packaged on a single card with each part in a separate compartment. I'll be very honest and say that, in general, Char-Broil does not have a good reputation for using quality materials. My first impression with the materials used in this unit didn't really do much to change that impression in my mind. The metal is thin and and the whole thing seems somewhat flimsy as it goes together. On the plus side, I was impressed with the overall heft once it all came together. Of course, the proof is in the performance, which I'll get to later. 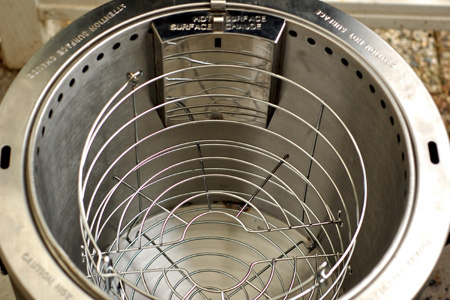 This cooker does require seasoning, but it's a brain-dead easy process. You simply coat all of the cooking surfaces and accessories with oil and run it on hight for 15 minutes, or until it stops smoking. It really couldn't be much easier. Once the unit was assembled and I fired it up for the first time to season it, I can tell that my early thoughts about the concept being sound remain. I think this thing might have some serious potential for those that don't want to deal with the muss and fuss that often accompanies more traditional outdoor cooking. Although I had some concerns about the quality early on, I now think that the quality of this unit just might strike a balance between great and good enough, but I'll reserve judgment for now. I cooked two whole chickens on it tonight and I'll share the results in the next post.